The Journal of Nonprofit Education and Leadership publishes quality manuscripts to disseminate the latest knowledge related to nonprofit education and leadership to help develop theory and practice. The journal seeks quantitative and/or qualitative research findings; conceptual or theoretical discussions; program best practices; teaching and research notes. 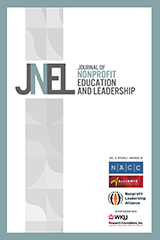 Subscribe to the Journal of Nonprofit Education and Leadership.